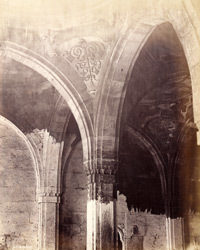 Photograph of the interior of Muhammad Ghaus Gwaliari's Mosque at Ahmadabad in Gujarat taken by Henry Cousens in the 1880s, from the Archaeological Survey of India. This mosque was built in c.1565 by the saint Shaikh Muhammad Ghauthu'l Alam of Gwalior. The interior is divided into squares by two rows of pillars connected by arches with carved pendentives, which support the almost flat domes. This view shows the carved detail on one of the pendentives of the arches.